» A rain tax in Albany’s future? A rain tax in Albany’s future? 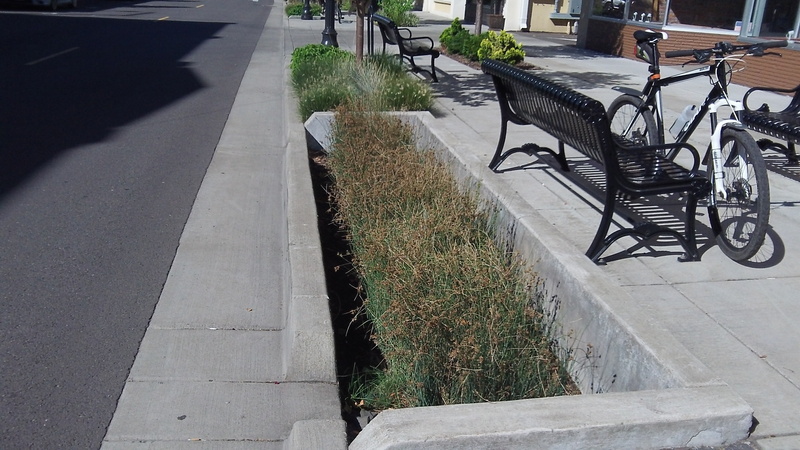 Features like this on Broadalbin Street are intended to collect and filter runoff from the street. Albany is launching a regulatory program to keep rainwater in new land developments out of storm drains so it doesn’t carry pollution into creeks and rivers. Not now, but sooner or later this is going to cost some money to administer, and when it does, the city may want to collect a monthly stormwater utility fee. Fair or not, it will be known as a tax on rain. The city council Wednesday stopped short of enacting the program. Councilor Bessie Johnson wanted to learn more about the fees that developers would be charged. She and Councilor Bill Coburn voted against enacting the 82 pages of code amendments in one sitting, so the final vote was put off until Sept. 24. The program seeks to have Albany comply with federal and state clean-water regulations. In summary, starting in 2015 it will require construction projects of more than one acre to also get permits for, design and build swales or other “facilities” to collect runoff from paved surfaces and roofs. To issue the required “post-construction strormwater quality permits,” the city would charge fees depending on the size of the facility and whether the private owner or the city has to maintain the facility in perpetuity. One code change would make sure that city inspectors could go on private property to check that the facility is working. That provision and others drew objections from Dan Watson, a private engineer who testified on behalf of the Willamette Valley Homebuilders. How much work this program takes to administer will depend on how much development there is. Existing buildings and parking lots are not affected. City officials say they want to run the program for a year or longer without adding staff to see how much work and expense it causes. If the costs are significant, they may eventually propose a stormwater utility fee for the council to adopt. True enough. OTOH, I don’t believe ANYone would like to go back to the days when the Willamette was someplace in which you wouldn’t dream of swimming due to the toxicity from pollutants running into it. So there obviously needs to be a balance. Making a natural filtering system as part of the advance planning makes the most sense — and it will only apply to those developments of 1 acre or larger — and no “retro” configuring is applicable. The process by which this came before us has been going on for a very long time with multiple public meetings and a couple of open house forums to show what some of these “facilities” may look like. I had no (and will not have) any problems voting to allow it to move forward. Background: The State has required Albany to adopt regulations requiring storm water quality (WQ) measures, in response to federal Clean Water Act requirements. The timing of the requirement was based on community size. Goals: The stated goals of water quality regulations include reducing storm water pollutant loads to rivers from the municipal storm water system and maintain total maximum daily loads (TMDL’s) of pollutants to below prescribed levels. City’s Proposal: The City proposes to require storm water treatment facilities on new projects creating or replacing 8,100 sf of impervious surface. These hearings were for the implementing legislation involving the Municipal Code, Fee structure and Development Code. Design Standards are being promulgated separately by the Public Work Department. How It Works Now: Both required and voluntary WQ features constructed on private property are included in the building permit. WQ features installed in the right-of-way are permitted through the SI (work in the ROW) permit issued by Public Works. Currently, the only allowed features in the ROW are vortex style WQ manholes. What we support: We support the allowance of vegetated treatment facilities in the ROW. We support Development Code changes that allow increased flexibility in locating the WQ features. We asked that it be made clear that the City maintains features in the public ROW. What we opposed: We opposed moving the permit process out of the building permit process for private facilities. Involving a Public Work SI permit for private will involve additional cost and time. We opposed language requiring recorded maintenance agreements and statement of financial responsibility for these facilities. The downside of these facilities not working is the storm runoff will not receive additional treatment and there similar to existing city drainage. These facilities should be treated as other drainage related permit requirements. We opposed the proposed right of entry language in 12.45.150 as being too intrusive and heavy handed. Current AMC Section 12.80.040 (applies to all drainage facilities) provides the City with the necessary authority to enter sites and remediate violations. The City proposal is in response State and Federal requirements and applies only to new development and re-development. Please keep it simple and not overly costly to comply. The majority of the pollutants in storm water are in the suspended sediment. Trapped catch basis, currently required by current building codes, do a large portion of the treatment by capturing sediment. Regular removal of trapped sediment is the most effective and cost effective task that can be done. The additional features required by the proposed regulations decrease pollutants, but at a higher cost and diminishing rate. Let’s focus on keeping our public and private investment in proportion with the returns and encourage regular cleaning of both pubic and private catch basin sumps. Question – If these “swales or other facilities” are to stop the flow of pollutants into streams and rivers where is it going to go? Won’t these locations hold those pollutants? What will keep them from leaching out into the ground water and or surrounding soil and eventually reach streams. I am in favor of keeping our streams clean but question the long term effectiveness of these “facilities”.